"One that I've found recently that I really like...using this Electro-Harmonix Electric Mistress effect and then using this DOD Analog Delay that Omar has that I'm borrowing right now. I turned off the original signal and had an echo maybe half a second long, or a little longer. And set it to one repeat or a couple of repeats," says John Frusciante, at 2:29:00 in this interview, talking about his use of the EHX Electric Mistress and DOD Analog Delay. The Electric Mistress is seen on the left from David's perspective. "Captain" Kirk Douglas mentions his Electro-Harmonix Stereo Electric Mistress. It is shown [@ 2:06] in the video. Use the Electro-Harmonix Stereo Electric Mistress Flanger Pedal to generate the slithering, panoramic textures of "Axis Bold As Love." Manually flange or freeze your sound in Filter Matrix mode. Chorus and Flanger work together seamlessly for unique stereo modulations. The Electric Mistress pedal is colorful and seductive! Controls: Rate, Flanger Depth, Chorus Depth. It can go really fast and warbly, or it can be subtle and shimmery. Below a certain 'rate', you can manipulate its comb filter for manual jet flanging, old-school goth style. Cool. A word of warning though; this sounds very different to the deluxe Electric Mistress, which is a pure Flanger/matrix thing. A lot of people do prefer that one, and if you're after, say, the Gilmour sound circa 'Animals', that's the one to get, not this one. This is more of a dual-purpose chorus and flanger for all-round modulation duties. It's not the best chorus or flanger sound in isolation, but combined they're lovely. 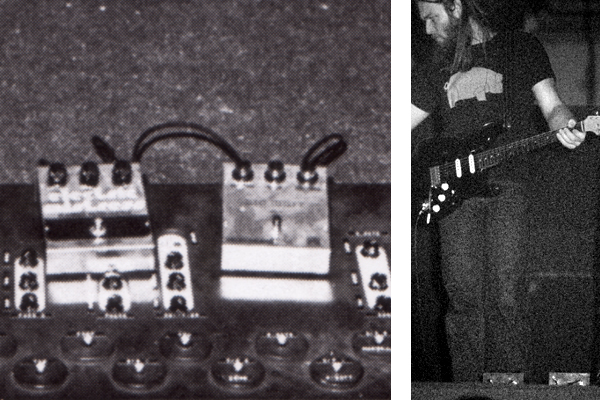 When using this great pedal, you are really starting to sound like Andy Summers or David Gilmour. There's a lot of interesting sounds to get out of the Electric Mistress, though the name may be somewhat misleading; the addition of a chorus pedal sets it apart from the vintage tone everyone seeks, and lacks the detailed controllability of other models. While it's simple design makes it easier to get a great tone out of, this isn't a pedal designed to do subtle; think Andy Summers/Police style tones. I do not like the new stereo electric mistress... I do not like the new clone theory... I do not like what EHX is doing to their classic modulation pedals AT ALL. I can't give this thing away. I've sued it as a chorus on occasion on keyboards. Yeah...I think they should have called it something else. It's nothing like the vintage Electric Mistress that true Gilmour/Andy Summers fans want. I just think it's a nice chorusy flanging thing, but it bears little relation to what old-timers would call a Mistress. I bought this as a flanger for one song my covers band play. i didn't care for it mainly but its earned a place on my board as a keeper. as a flanger its great and as a chorus/flanger thing its great. as a chorus its rubbish... got mine cheap at 55 quid including the wall wart. its not the best 55 quid ive ever spent...(ive been to Amsterdam, but that's another story) but its up there. I love the swirling or pulsating sound this pedal gives. Can shimmer on slow rates or wobble on fast settings, then you can mix a Chorus to it. This baby is the first pedal I own from EHX. A cool mix of Chorus and Flanger with only three knobs. Still, the controls are enough, plus there is an awesome matrix mode to create even more weird sounds. Must say it is well-made, tight and has huge comfortable knobs. I like how it looks in the pedalboard: the LED has few different states so that it shows not only the maximum position of the envelope, but also the mid-state. Perfect, will go for more EHX for sure! Having mono inputs limits this pedal a lot. EHX is assuming that this pedal will be the first in my stereo chain. They do the same with all of their other pedals. This means, if you're a fan of EHX pedals, you can only use one of their stereo pedals in stereo. Other than that... this is a great sounding pedal.